A surveillance screenshot of Rice shot by the police; this screenshot is of an enhanced video released for the grand jury. The shooting of Tamir Rice, a 12-year-old African-American boy (June 25, 2002 – November 23, 2014), by a white police officer, occurred on November 22, 2014, in Cleveland, Ohio. The shooting by officer Timothy Loehmann resulted in Tamir Rice's death. Two police officers, 26-year-old Timothy Loehmann and 46-year-old Frank Garmback, responded after receiving a police dispatch call of a black male that "keeps pulling a gun out of his pants and pointing it at people". A caller reported that a male was pointing "a pistol" at random people in the Cudell Recreation Center. At the beginning of the call and again in the middle he says of the pistol "it's probably fake". Toward the end of the two-minute call, the caller stated "he is probably a juvenile". However, this information was not relayed to Loehmann or Garmback on the initial dispatch. The officers reported that upon their arrival, they both continuously yelled "show me your hands" through the open patrol car window. Loehmann further claimed that instead of showing his hands, it appeared as if Rice was trying to draw: "I knew it was a gun and I knew it was coming out". In response, the officer shot twice, hitting Rice once in the torso. He died on the following day. Rice's gun was later found to be an airsoft replica that lacked the orange-tipped barrel, which would have indicated it was a nonlethal gun. A surveillance video of the incident was released by police four days later, on November 26. On June 3, 2015, the County Sheriff's Office released a statement in which they declared their investigation to be completed and that they had turned their findings over to the county prosecutor. Several months later, the prosecution presented evidence to a grand jury, which declined to indict primarily on the basis that Rice was drawing what appears to be an actual firearm from his waist as the police arrived. A lawsuit brought against the city of Cleveland by Rice's family was subsequently settled for $6 million in an effort to reduce taxpayer liabilities. In the aftermath of the shooting, it was revealed that Loehmann, in his previous job as a police officer in the Cleveland suburb of Independence, had been deemed an emotionally unstable recruit and unfit for duty. Loehmann did not disclose this fact on his application to join the Cleveland police, and Cleveland police never reviewed his previous personnel file before hiring him. In 2017, following an investigation, Loehmann was fired for withholding this information on his application. An FBI review by retired agent Kimberly Crawford found that Rice's death was justified and Loehmann's "response was a reasonable one", despite the fact Loehmann was deemed emotionally unstable and unfit for duty. The incident received national and international coverage, in part due to the time of its occurrence, coming shortly after the police shootings of numerous other black males. A 9-1-1 caller, who was sitting in a nearby gazebo, reported that someone, possibly a juvenile, was pointing "a pistol" at random people in the Cudell Recreation Center. The caller twice said that the gun was "probably fake". According to police spokesmen, it was initially unclear whether or not that information had been relayed to the dispatched officers, Loehmann and Garmback, and it was later revealed that the dispatcher had not elaborated beyond referencing "a gun". According to one report, the 9-1-1 responder twice asked whether the boy was black or white before dispatching officers to the park at around 3:30 p.m. The actual recording of the phone call reveals that the 9-1-1 responder asked whether the boy was black or white three times; however, the question was repeated only after the caller continued describing the color of Rice's clothing. The caller then left the gazebo, and Rice sat down in it sometime later. According to information reported to the press on the day of the shooting by Cleveland Police Patrolmen's Association President Jeffrey Follmer, "[Loehmann and Garmback] pulled into the parking lot and saw a few people sitting underneath a pavilion next to the center. [Loehmann] saw a black gun sitting on the table, and he saw the boy pick up the gun and put it in his waistband." Also on that date, Cleveland Deputy Chief Tomba stated, "The officer got out of the car and told the boy to put his hands up. The boy reached into his waistband, pulled out the gun and [Loehmann] fired two shots." According to Chief Tomba, "the child did not threaten the officer verbally or physically." On November 26, the day a video of the shooting was released, Chief Tomba is quoted as saying, "Loehmann shouted from the car three times at Tamir to show his hands as he approached the car." The entire incident happened in less than two seconds. The officers later found that the gun was an Airsoft gun which had had its orange safety tip removed. These weapons are actual size replicas of real guns, designed to shoot non-lethal plastic pellets. Rice died the day after the shooting at MetroHealth Medical Center. The medical examiner clarified the cause of death as being a gunshot wound to the torso, with injuries to major vessels, intestines, and the pelvis. A surveillance video without audio of the shooting was released by police on November 26 after pressure from the public and Rice's family. It showed Rice pacing around the park, occasionally extending his right arm. The video briefly shows Rice talking on a cellphone, and sitting at a picnic table in a gazebo. A patrol car moves at high speed across the park lawn and then stops abruptly by the gazebo. Rice reaches for his waist band before Loehmann jumps out of the car and immediately shoots Rice from a distance of less than 10 feet (3.0 m). According to Judge Ronald B. Adrine in a judgement entry on the case "this court is still thunderstruck by how quickly this event turned deadly.... On the video the zone car containing Patrol Officers Loehmann and Garmback is still in the process of stopping when Rice is shot." Neither Loehmann nor Garmback administered any first aid to Rice after the shooting. Almost four minutes later, a police detective and an agent from the Federal Bureau of Investigation, the latter of whom was working a bank robbery detail nearby, arrived on the scene and treated the boy. Three minutes after that, paramedics arrived and took him to MetroHealth Medical Center. Rice's mother said that the toy gun had been given to him to play with by a friend minutes before the police arrived, that police tackled and put her 14-year-old daughter in handcuffs after the incident, and that police threatened her with arrest if she did not calm down after being told about her son's shooting. A second video obtained by the Northeast Ohio Media Group and released on January 7, 2015, shows Rice's 14-year-old sister being forced to the ground, handcuffed and placed in a patrol car after she ran toward her brother about two minutes after the shooting. It also shows that police waited for four minutes before providing any first aid to Rice. In the aftermath of the shooting, media outlets reported on the background of the police officers involved. Both officers were placed on paid administrative leave. On December 28, 2015, the grand jury returned its decision declining to indict the police officers. Loehmann, the officer who fired the shots that killed Rice, joined Cleveland's police force in March 2014. In 2012, he had spent five months with the police department in Independence, about 13 miles (21 km) south of Cleveland, with four of those months spent in the police academy. In a memo to Independence's human resources manager, released by the city in the aftermath of the shooting, Independence deputy police chief Jim Polak wrote that Loehmann had resigned rather than face certain termination due to concerns that he lacked the emotional stability to be a police officer. Polak said that Loehmann was unable to follow "basic functions as instructed" and specifically cited a "dangerous loss of composure" that occurred in a weapons training exercise. Polak said that Loehmann's weapons handling was "dismal" and he became visibly "distracted and weepy" as a result of relationship problems. The memo concluded, "Individually, these events would not be considered major situations, but when taken together they show a pattern of a lack of maturity, indiscretion and not following instructions, I do not believe time, nor training, will be able to change or correct these deficiencies." It was subsequently revealed that Cleveland police officials never reviewed Loehmann's personnel file from Independence prior to hiring him. He had been hired in Cleveland despite listing his primary source of income for the prior six months having been derived from "under-the-table jobs." On May 30, 2017, the mayor of Cleveland announced that Loehmann had been fired for concealing details about his past employment in his job application. On his application, Loehmann said that he had left the Independence Police Department for "personal reasons" and did not reveal the Independence police's determination that he had "an inability to emotionally function" as an officer. On October 5, 2018, the city of Bellaire, Ohio, hired Loehmann as a part-time officer. Five days later, Loehmann withdrew his application to the Bellaire police department, and his training ceased. Garmback, who was driving the police cruiser, has been a police officer in Cleveland since 2008. In 2014, the City of Cleveland paid US$100,000 to settle an excessive force lawsuit brought against him by a local woman; according to her lawsuit, Garmback "rushed and placed her in a chokehold, tackled her to the ground, twisted her wrist and began hitting her body" and "such reckless, wanton and willful excessive use of force proximately caused bodily injury". The woman had called the police to report a car blocking her driveway. The settlement does not appear in Garmback's personnel file. The Cleveland Police Department received statements from both Loehmann and Garmback. They announced they were looking for additional witnesses to the shooting, including a man who was recorded walking with Rice in the park before the shooting. Their results would be presented to a grand jury for possible charges. On January 1, 2015, the Associated Press reported that Cleveland police department officials were looking for an outside agency to investigate the Rice shooting, as well as handle all future investigations related to deadly use-of-force incidents. On May 15, Mother Jones magazine reported that, six months after the shooting, while the sheriff's department announced that it had almost concluded its investigation of the shooting, neither of the two officers involved had yet been interviewed by investigators from the Cuyahoga County Sheriff's Office. It also reported that as of that time Frank Garmback, the officer who drove the police car, was not under criminal investigation. On June 3, the Cuyahoga County Sheriff's Office released a statement in which they declared their investigation to be completed and that they turned their findings over to prosecutor Tim McGinty, who was expected to review the report and decide whether to present evidence to a grand jury. In response to a petition from citizens, on June 11 Municipal Court Judge Ronald Adrine agreed that "Officer Timothy Loehmann should be charged with several crimes, the most serious of them being murder but also including involuntary manslaughter, reckless homicide, negligent homicide and dereliction of duty." Judge Adrine also found probable cause to charge Officer Frank Garmback with negligent homicide and dereliction of duty. Because Ohio judges lack the legal authority to issue arrest warrants in such cases, his opinion was forwarded to city prosecutors and Cuyahoga County Prosecutor Timothy McGinty who, as of that date, had not yet come to a decision on whether to present the evidence to a grand jury. On June 13, Cuyahoga County Prosecutor Tim McGinty released a redacted 224-page report of the investigation. The report included interviews with at least 27 people, including teachers, friends, and the person that called 911. Loehmann and Garmback declined to be interviewed. Contradicting statements made by police that Loehmann shouted "show your hands" three times before firing, the report included accounts from several witnesses who claimed to have not heard officers issue any verbal warning to Rice. On October 10, the Cuyahoga County prosecutor's office released two reports that McGinty had sought from outside experts about the use of force, one by retired FBI agent Kimberly Crawford, a second by Colorado prosecutor S. Lamar Sims; both reports concluded that the shooting of Tamir Rice was reasonable under the circumstances. However, amid accusations from lawyers representing the Rice family that McGinty had deliberately chosen Crawford and Sims because of their "pro-police bias" in order to cover for Loehmann and Garmback, McGinty convened a grand jury to consider whether or not criminal charges should be brought against the officers. On December 28, McGinty reported that the grand jury had decided not to indict Loehmann or Garmback, saying, "Given this perfect storm of human error, mistakes, and communications by all involved that day, the evidence did not indicate criminal conduct by police." The announcement prompted Rice's mother to release a statement accusing McGinty of mishandling the investigation, stating in part, "Prosecutor McGinty deliberately sabotaged the case, never advocating for my son, and acting instead like the police officers' defense attorney." On December 5, 2014, Rice's family filed a wrongful death suit against Loehmann, Garmback, and the City of Cleveland in the United States District Court for the Northern District of Ohio. The eight-page complaint accused Loehmann and Garmback of acting "unreasonably, negligently [and] recklessly" and that "[h]ad the defendant officers properly approached Tamir and properly investigated his possession of the replica gun they would undoubtedly have determined ... that the gun was fake and that the subject was a juvenile." It also accused the City of Cleveland for failing to properly train both officers, as well as failing to learn about the Independence police department's internal memo about Loehmann. On April 25, 2016, the lawsuit was settled in an effort to reduce taxpayer liabilities, with the City of Cleveland agreeing to pay Tamir Rice's family $6 million ($5.5 million to Tamir Rice's estate, $250,000 to the child's mother, and $250,000 to the child's sister). In the wake of the shooting, protests and public outcry broke out in Cleveland, although they were relatively minor. However, on November 25, 2014, a day after a grand jury decision to not indict the police officer who fatally shot Michael Brown, the Cleveland protests became more prominent. That day, about 200 protesters marched from Public Square to the Cleveland Memorial Shoreway, causing the latter to be shut down temporarily. Rice's family pleaded with the protesters to remain peaceful in their activities, saying, "Again, we ask for the community to remain calm. Please protest peacefully and responsibly." On December 5, Ohio Governor John Kasich established a task force to address community-police relations in response to Rice's shooting and other similar incidents. Rice's death has been cited as one of several police killings which 'sparked' the nationwide Black Lives Matter movement. The incident received national and international coverage, in part due to the time of its occurrence, coming shortly after the recent police shooting of Michael Brown in Ferguson, Missouri; the death of Eric Garner in Staten Island, New York; the police shooting of Akai Gurley in Brooklyn, New York just two days before; the shooting of John Crawford III in Dayton, Ohio; and the subsequent unrest following these incidents had attracted worldwide attention. The Northeast Ohio Media Group was criticized for publishing a news story on Rice's parents' criminal records. A funeral service for Rice was held at the Mount Sinai Baptist Church on December 3, 2014, with about 250 people in attendance. He was remembered "for his budding talents and described as a popular child who liked to draw, play basketball and perform in the school's drum line." Family members criticized Loehmann for acting too quickly in Rice's shooting. ^ a b c "City of Cleveland to pay $6 million to Tamir Rice's family to settle lawsuit". ^ "Cleveland mayor apologizes for Tamir Rice ambulance claim". February 12, 2017 – via Reuters. ^ "Tamir Rice Shooting - Cleveland Police Dispatch Radio". YouTube. November 24, 2014. ^ a b c Izadi, Elahe; Holley, Peter (November 26, 2014). "Video shows Cleveland officer shooting 12-year-old Tamir Rice within seconds". The Washington Post. Retrieved November 26, 2014. ^ Tom McCarthy in New York, Tamir Rice: video shows boy, 12, shot 'seconds' after police confronted child The Guardian. Retrieved November 26, 2014. ^ Tamir Rice Shooting: Tamir Rice Shooting 911 Call Released By Cleveland Police Tamir Rice Video. YouTube. November 26, 2014. ^ "Tamir Rice Shooting: Tamir Rice Shooting 911 Call Released By Cleveland Police Tamir Rice Video". YouTube. November 26, 2014. ^ "Cleveland cop who murdered 12-year-old Tamir Rice not told boy's age". Daily News. New York. Retrieved December 13, 2014. ^ "Tamir Rice shooting: Officers were not told the gun could be a fake or that suspect was juvenile". newsnet5.com - Cleveland. Archived from the original on February 17, 2016. Retrieved November 24, 2014. ^ "CBS, Show me your hands and reaching claim". ^ a b "Judgement entry on Tamir Rice case". scribd.com. June 11, 2015. Retrieved October 14, 2015. ^ Ferrell, Nikki (November 26, 2014). "Cleveland Police name Timothy Loehmann, officer who killed Tamir Rice, 12, on west side". Scripps TV Station Group. Retrieved November 27, 2014. ^ a b MacDonald, Evan (November 24, 2014). "Cause of death released for 12-year-old boy shot by Cleveland police". Retrieved November 26, 2014. ^ a b c Fitzsimmons, Emma (November 23, 2014). "12-Year-Old Boy Dies After Police in Cleveland Shoot Him". The New York Times. Retrieved November 25, 2014. 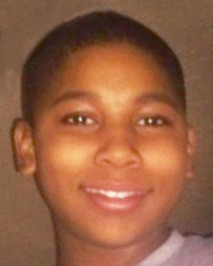 ^ a b "Tamir Rice: US police kill boy, 12, carrying replica gun". BBC. November 24, 2014. Retrieved November 25, 2014. ^ a b c "Protests break out in Cleveland over Tamir Rice shooting, Ferguson grand jury decision". The Plain Dealer. ^ "Tamir Rice investigation complete, going to prosecutor". WKCY. Retrieved June 8, 2015. ^ a b "No Indictment For Cop Who Fatally Shot 12-Year-Old Tamir Rice". The Huffington Post. Retrieved December 28, 2015. ^ a b c Mai-Duc, Christine. "Cleveland officer who killed Tamir Rice had been deemed unfit for duty". Los Angeles Times. Retrieved December 5, 2014. ^ a b c Lindsey Bever & Wesley Lowery, Cleveland police officer who fatally shot 12-year-old Tamir Rice is fired — but not for the killing, Washington Post (May 30, 2017). ^ a b c "Cleveland police officer shot Tamir Rice immediately after leaving moving patrol car". The Plain Dealer. ^ a b c "Video Shows Cleveland Cop Shoot 12-Year-Old Tamir Rice Within Seconds". NBC News. ^ "12-year-old boy playing with fake gun dies after being shot by Ohio police". ^ "911 caller: 99 -year-old boy shot by US police probably had a 'fake' gun". YouTube. ^ a b "Cleveland police officer shoots 12-year-old boy carrying BB gun". The Plain Dealer. ^ "Tamir Rice shooting video shows cop shot him within 2 seconds"
^ "Video: Cop shot boy seconds after encountering him". Yahoo News. November 26, 2014. Archived from the original on November 26, 2014. ^ Caroline Bankoff (November 29, 2014). "Cops Who Shot Tamir Rice Didn't Bother to Give Him First Aid". New York. ^ "Police Who Shot 12-Year-Old Tamir Rice Did Not Give Him First Aid". TPM. ^ "12-Year-Old Boy's Fatal Shooting By Cops Could Have Been Avoided: Family". The Huffington Post. ^ a b c "Video shows Cleveland officer shooting 12-year-old Tamir Rice within seconds". The Washington Post. ^ "Family of Boy Killed by Cleveland Officer to Pursue Criminal Case". The New York Times. Retrieved December 9, 2014. ^ McCormack, Simon. "New Video Of Tamir Rice Shooting Shows Police Arresting Sister, Delaying First Aid". The Huffington Post. ^ "Officers involved in Tamir Rice shooting remain on the job, away from public". Fox 8 Cleveland. A Tribune Broadcasting Station. June 5, 2015. Retrieved December 28, 2015. The chief’s office confirms both officers are still on the job and working in units that do not involve any contact with the public. ^ "Family of Tamir Rice, 12-year-old Cleveland boy fatally shot by police, question cops' training, call death avoidable". Daily News. New York. ^ Erica Hellerstein (December 12, 2014). "On Job Application, Cop Who Killed 12-Year-Old Listed 'Under-The-Table Jobs' As Prior Employment". ThinkProgress. ^ Hanson, Shelley (October 5, 2018). "Embattled Bethesda chief also added to force". Times Leader Online. Martin's Ferry, Ohio: Ogden Newspapers. Retrieved October 7, 2018. ^ Cross, Ian (October 10, 2018). "Officer who killed Tamir Rice withdraws application to Bellaire Police Department". newsnet5. Retrieved October 11, 2018. ^ "Cleveland paid out $100,000 to woman involving excessive force lawsuit against officer in Tamir Rice shooting". The Plain Dealer. Retrieved December 5, 2014. ^ "Justice Department's scathing review; another excessive force lawsuit". The Plain Dealer. Retrieved December 5, 2014. ^ "Cleveland Seeks Outside Probe In Tamir Rice Shooting". Associated Press. January 1, 2015. Retrieved January 28, 2015. ^ Lee, Jaeah. "It's Been 6 Months Since Tamir Rice Died, and the Cop Who Killed Him Still Hasn't Been Questioned". Mother Jones. Mother Jones and the Foundation for National Progres. Retrieved May 18, 2015. ^ Graham, David A. (June 11, 2015). "'Probable Cause' in the Killing of Tamir Rice". The Atlantic. Retrieved June 12, 2015. ^ "Tamir Rice investigation released by Cleveland prosecutors". Los Angeles Times. Retrieved June 13, 2015. ^ "Witness accounts in Tamir Rice investigation paint vivid picture of events". The Plain Dealer. Retrieved June 13, 2015. ^ "Tamir Rice investigation released: The Big Story". The Plain Dealer. Archived from the original on June 14, 2015. Retrieved June 14, 2015. ^ Cory Shaffer (October 28, 2015). "Grand jury hearing evidence in Tamir Rice shooting". Cleveland.com. Retrieved July 26, 2016. ^ "Tamir Rice shooting: No charges for officers". CNN. December 28, 2015. Retrieved July 26, 2016. ^ Sean Flynn (July 14, 2016). "The Tamir Rice Story: How to Make a Police Shooting Disappear". GQ. Retrieved July 26, 2016. ^ "Family of Tamir Rice, 12-Year-Old Shot By Cop, Files Wrongful Death Suit". NBC News. ^ "Tamir Rice's family files wrongful death suit against Cleveland police officers". fox8.com. ^ "Tamir Rice's family files wrongful death lawsuit after fatal shooting of 12-year-old in Cleveland". The Washington Post. ^ "Tamir Rice's family plead with supporters to stay peaceful amid fears of more violent protests - Daily Mail Online". Daily Mail. ^ "Kasich police commission Ferguson Beavercreek". daytondailynews.com. ^ Williams, Yohuru. "You're Nobody 'Till Somebody Kills You: Baltimore, Freddie Gray and the Problem of History". The Huffington Post. Retrieved May 29, 2015. ^ "Activists blast NYPD attempts to silence movement for change". Black Lives Matter. Retrieved May 24, 2015. ^ Daniel Politi (November 28, 2014). "Cleveland Paper Thinks You Should Know Tamir Rice's Father Has Abused Women". Slate. ^ Nick Wing (November 26, 2014). "Police Gunned Down A 12-Year-Old And Somehow Local News Decided To Run This Story". The Huffington Post. ^ Nicole Hensley, "Tamir Rice’s family blasts police at boy’s Cleveland funeral", Daily News (New York), December 3, 2014. ^ "Tears at Funeral for Cleveland Boy Tamir Rice Shot by Cop". NBC News. December 3, 2014. Retrieved May 12, 2015. This page was last edited on 24 April 2019, at 11:00 (UTC).